The Dingo has intense eyes that vary in color from yellow to orange. The very mobile, small, rounded ears are naturally erect. The well furred, appearing bushy, tail is relaxed and has good length. The hindquarters are lean and muscular. The coat is soft. It's length, density, and texture vary according to climate. Typical coat colors are yellow-ginger, but can occur in tan, black or white, including an occasional brindle; albinos have also been seen. 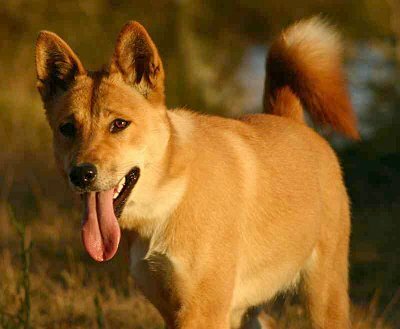 All purebred Dingos have white hair on their feet and tail tip. Unlike most other breeds, Dingos do not have due claws. 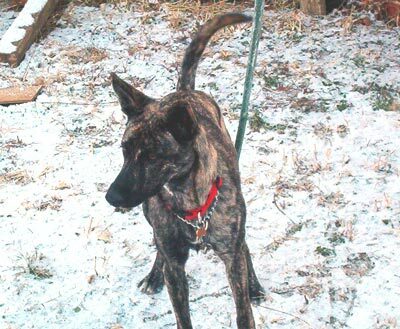 a mutt raised by EARTHDOG!